Ivory Free Ohio-IFOH | Join the Global Movement to Ban Ivory, Rhino horn, and Trophy Hunting Products. Join the Global Movement to Ban Ivory, Rhino horn, and Trophy Hunting Products. My name is Christina LaMonica and I am the Founder and President of Ivory Free Ohio, a grassroots organization dedicated to ending the sale and trade of all Ivory, Rhino Horn, and Trophy Hunting products. We have never met in person, but we have communicated over the telephone and through emails regarding the push to have these products banned in the state of Ohio. As you may know I approached my District Senator in June, 2015. I wanted to educate him about the devastating effects of the illegal Ivory trade, while encouraging him to create Legislation that would protect our national security and help save Africa’s keystone species from extinction. I had the wonderful opportunity of unveiling “Ivory Free Ohio” to a National and International audience at the Third Annual International March for Elephants and Rhinos in Washington, D.C. The March was sponsored by Elephants D.C. and iWorry, an organization launched by Actress Kristin Davis; Patron and Ambassador to the David Sheldrick Wildlife Trust in Nairobi, Kenya. I was invited as a guest speaker, together with; New Jersey Assemblyman; Raj Mukherji, who succeeded in an outright ban of Ivory and Rhino Horn products in his state with Senator Raymond J. Lesniak. Pennsylvania Representative; Madeleine Dean who introduced HB 1537, and Premier Conseiller; Rod Rembendambya on behalf of His Excellency Michael Moussa-Adamo with the Embassy of Gabon in Washington, D.C., just to name a few. As Founder of Ivory Free Ohio: a grassroots initiative committed to ending the trade of Ivory, Rhino Horn, and Trophy Hunting Products, my speech was framed around cultivating the courage to create change within our communities, educating ourselves and others on environmental policy, and bridging the gap of communication with State and Federal Legislators on how the trade of these products funds terrorism, threatens our national security, and our keystone species. The 45-year-old Sudan, the sole remaining male of the rare subspecies of white rhino, died in Kenya. By CAMILLA SCHICK on Publish Date March 20, 2018. Photo by Thomas Mukoya/Reuters. In an interview with Piers Morgan set to air Sunday night in the U.K., President Donald Trump used the word “terrible” to describe the initial decision last year by the U.S. 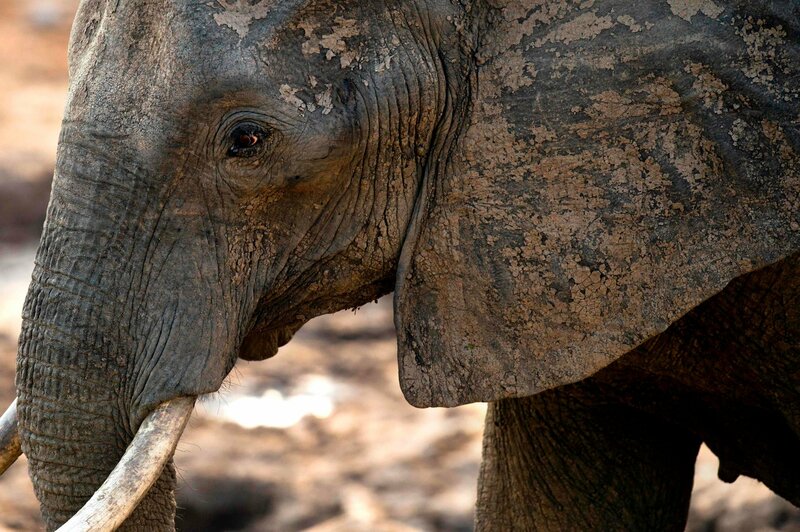 Fish and Wildlife Service to overturn an Obama era ban on the import of elephant trophies. Trump also says he does not believe the substantial fees that hunters pay to hunt elephants and other species actually go toward conservation efforts, as is often claimed, and instead are pocketed by government officials in other countries. Trump confirms that the ban on importing elephant trophies from the African nations of Zimbabwe and Zambia will remain in place. That was not clear after he initially put the ban reversal on hold, pending further study. Protector of the Giants; Ranger Johnny “Mad-dog” Abenja. Nanyuki, Kenya. Lion Country in Rust en Vrede, South Africa, with Christina LaMonica. Ivory Crush Reception at Tavern on the Green in New York City, with Kristin Davis and Christina LaMonica. Kristin is a Patron and Ambassador to The David Sheldrick Wildlife Trust in Nairobi, Kenya. Jim Justus Nyamu of the Elephant Neighbors Center in Nairobi, Kenya and Christina LaMonica. Christina LaMonica in Times Square for the US Fish and Widlife Services; Ivory Crush in June, 2015. New York Ivory Crush in Times Square, June, 2015. Mr. Azzedine Downes, President and CEO of the International Fund for Animal Welfare – IFAW with Christina LaMonica. Director Jimmiel J. Mandima of the African Wildlife Foundation and Christina LaMonica in Times Square. for the second Ivory Crush on American soil in U.S. history. Cynthia Newlin O’Connor (center) and Christina LaMonica, in Times Square for the US Fish and Wildlife Services; Ivory Crush. Cynthia’s testimony led to the enactment of legislation in New York banning the sale of Ivory and Rhino horn products. She also was responsible for the second Ivory crush in U.S. history on American soil in New York City. Melissa Sciaccao, Director of The David Sheldrick Wildlife Trust in Ivrine, California, and Christina LaMonica at the New York Ivory Crush in Times Square, June, 2015. Ivory Crush Reception at Tavern on the Green in New York City. Food Critic, Chef, and Television Host; Katie Lee of the Food Network and Christina LaMonica. Ms. Iris Ho; Wildlife Campaign Manager, Humane Society International and Christina LaMonica, at the Ivory Crush Reception at Tavern on the Green in New York City. Braves singer; Jericho and Christina LaMonica, at Tavern on the Green in New York City for the Humane Society United States Reception. Ivory Crush Reception at Tavern on the Green in New York City, with Ms. Heidi Osterman; District Leader Volunteer with the Humane Society United States and Christina LaMonica. Ivory Free Ohio Founder; Christina LaMonica delivers White House speech. We beat the ivory trade once. Now we must beat it once and for all.